Watch birds fly into action all season long with the Sorbus bird feeder! Enjoy the vibrant, majestic beauty of bird watching! This classic hanging bird feeders is the perfect way to attract beautiful birds to your home. 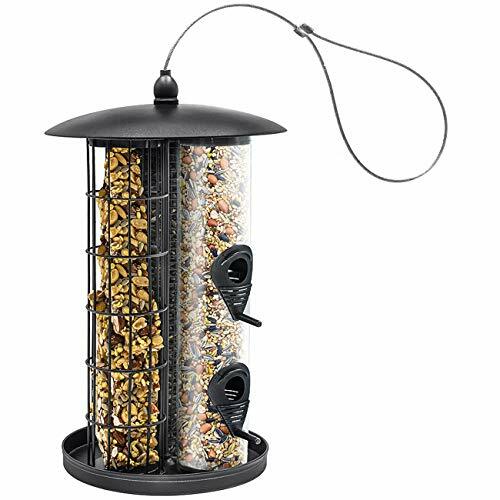 It features a triple tube combination to feed a variety of birds from all angles. Watch as finches, cardinals, woodpeckers, and more flock to this adorable bird feeder for a tasty meal. As the birds dine, the feeder slowly dispenses the seeds. With a squirrel proof design, the lid stays put preventing greedy squirrels from stealing your supply. For convenience, the catching tray helps keep seeds off the ground. Hang anywhere to beautifully complement your patio, garden, or backyard landscape. Hang your bird feeders anywhere birds are safe and you can enjoy the view. For an enjoyable activity inside, look out the window and view the colorful birds as you relax and unwind for the day. Outside, hang your bird feeders near a window, tree, fence, in the garden, or on the side of your home for display. Kids and grandparents will especially be entertained as our feathered friends flock to the backyard deck for an afternoon snack. When the seeds are gone, kids can get involved and help refill the seed supply. The caged frame allows you to see exactly when it's time to replenish and it's easy to fill by simply raising the top lid. Heavy duty design that is easy to fill and hang. Each birdfeeder is designed with a circular design, rooftop lid closure, and loop hanger. Made of clear plastic and powder coated iron construction with black finish. It's compact, lightweight, and easy to fill with a top opening . Seeds NOT INCLUDED. Measures approximately 8.75" D x 25" H.
Enjoyable activity for elderly, children, nature, garden, and bird lovers everywhere! If you have any questions about this product by Sorbus, contact us by completing and submitting the form below. If you are looking for a specif part number, please include it with your message.